Raymond Blanc's recipe for chocolate éclairs is full of tips and advice, including how to freeze. Equipment and preparation: You will need a large piping bag fitted with a 1.5cm/½in fluted nozzle and a 0.5cm/¼in nozzle. For the choux pastry, place the water, milk, butter, sugar and salt in a medium saucepan over a high heat and bring the mixture to a boil. Remove the pan from the heat and, using a wooden spoon, quickly beat in the flour until the mixture is completely smooth. Turn the heat down to medium, return the pan to the hob and cook for about one minute, beating all the time, or until the mixture comes away from the edge of the pan. 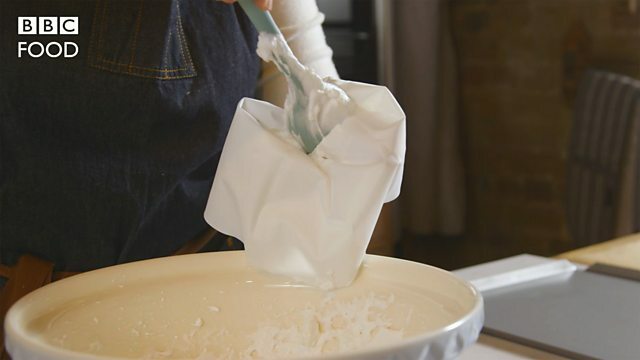 Transfer the paste to a large piping bag fitted with a 1.5cm/½in fluted nozzle and let the mixture to cool for about five minutes in the bag to stiffen slightly before you begin the piping. 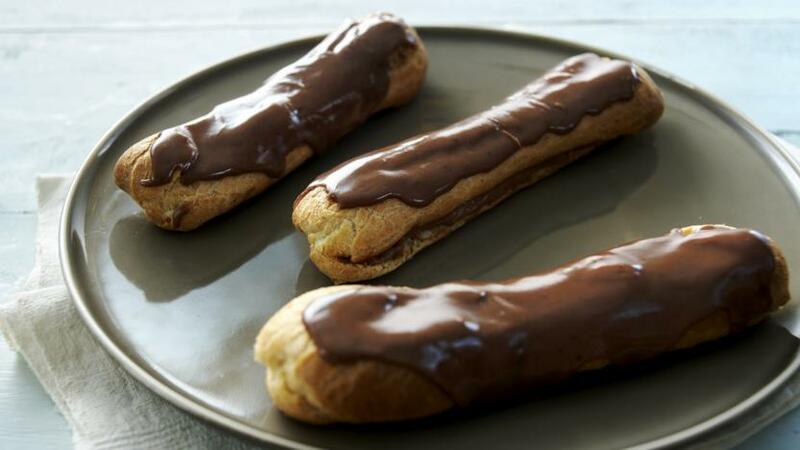 Line a large baking tray with greaseproof paper and pipe on 12 éclairs, each about 15cm/6in long. Alternatively, for a more professional and uniform finish, pipe four rows of pastry, each about 36cm/14in long, onto a non-stick tray and freeze. Cut the frozen strips into three and either defrost and cook as below, or bake from frozen and add five minutes to the cooking time. Bake the éclairs in the preheated oven for 30-35 minutes or until golden-brown, then transfer to a rack and leave to cool. (or crème patissière) can be made up to three days in advance and stored in the fridge. Alternatively flavour the pastry cream with coffee or vanilla extract instead of chocolate and do not add the cocoa powder to the glaze.